Pax Americana, in Montrose. Photo by Nathan Colbert Photography. Montrose hotspot Pax Americana is welcoming summer with a new happy hour menu chock-full of specials on cocktails, small plates, beer and wines. We were invited to preview the new menu and cocktails last night. Happy hour runs from 5 p.m. to 7 p.m. Tuesday through Sunday (closed on Mondays), which makes it a fantastic weekend destination. During these hours, a selection of classic cocktails are available for $5 each. Wines by the glass are available for $7, and Odell Brewing’s Drumroll American Pale Ale is only $5. Newly created summer cocktails are discounted $2 per drink. The Korean Red Pepper Pork Ribs are both spicy and sweet. Photo by Nathan Colbert Photography. Having earned the title only a few months ago, Executive Chef Martha De Leon has created a happy hour menu with six very impressive small plates priced between $5 and $10. 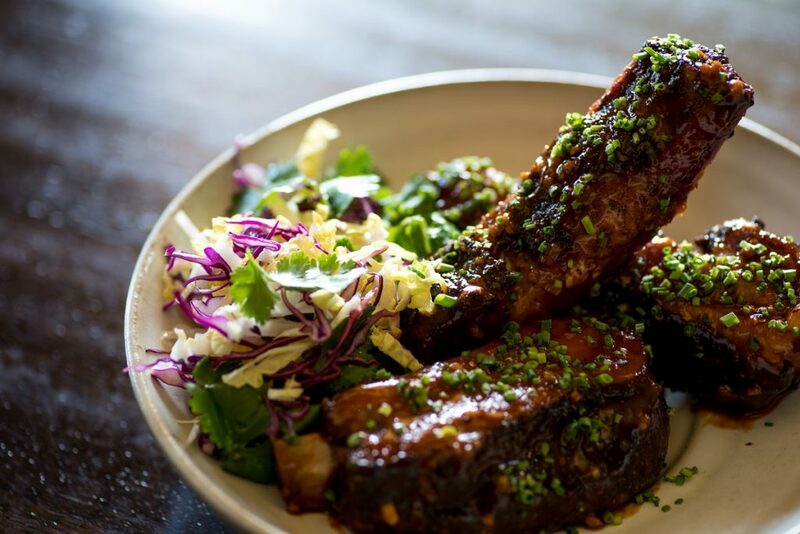 Pork fans can enjoy both the gochujang, ginger and garlic-marinated Korean Red Pepper Pork Ribs, plus the Chappapeela Farms Pork Sausage with banana pepper romesco sauce. The Panzanella Salad with juicy heirloom tomatoes, Slow Dough croutons and award-winning Croatian Daltimanic cheese is a steal for only $6. Don’t miss the Brazos Valley Marinated Labneh, which is served with a wood-grilled pita flatbread, tomatoes and purple mint. The Sonic Boom cocktail. Photo by Nathan Colbert Photography. Bar Manager Michelle Womack shows her creativity with refreshing cocktails that pack a boozy punch. 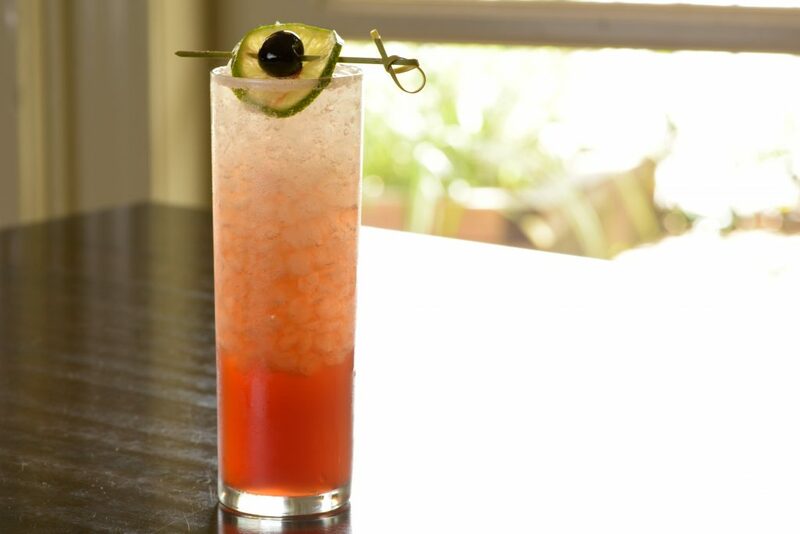 Pictured above, the Sonic Boom combines Old Forester bourbon, Cherry Heering, lime cordial and is topped with Topo Chico for a tongue tingling kick of carbonation. It’s poured over (and named after) what Womack calls the “best ice, ever!” — Sonic style ice. The Pax bar crew has also improved on what we previously felt was perfection in a mug — Vietnamese Coffee, or ca phe sua da. Womack uses Huynh’s coffee, a hefty pour of Plantation 3 Star Rum and condensed milk served layered, for you to mix together. Poured over ice like traditional Vietnamese Coffee, this brilliance of the drink is in the simplicity. We’re not sure if we’ll be able to go back to traditional Vietnamese Coffee, which is quite the compliment. 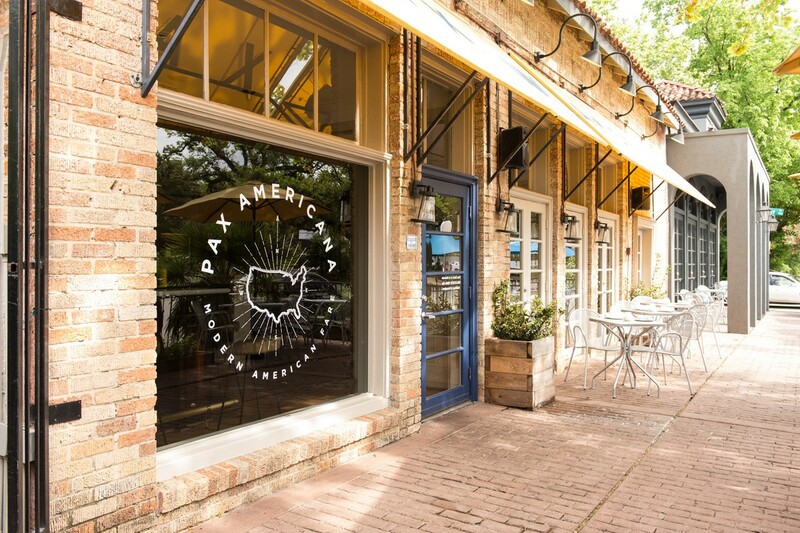 Reservations can be made at www.paxamericana.com or by calling the restaurant.